Note: Some links may no longer be active but the listing is kept for the historical record. Recent events at the top. Leading in Community (LIC) is a leadership development program with a goal to broaden and strengthen the leadership pipeline for people of color and prepare them for nonprofit and community leadership on Long Island. and are working or about to start a job, we are collecting data to put together a comprehensive report about working graduates. RSVP to mpatel9@health.nyc.gov by April 1st. What Do Providers Want to Know About Peer Support Services (Part 2)? Early Bird Registration for the 2019 Alternatives Conference. Nominate a keynote presenter for the 2019 Alternatives Conference. Join others in the role of Lead Family Contact in a system of care to share key information, identify solutions and discover new topics of interest. Hosted by the Family-Run Executive Director Leadership Association (fredla). Anti-oppressive Practice is Good Practice! Let’s Examine “the why” about Anti-oppressive Practice and Explore How to Implement It. 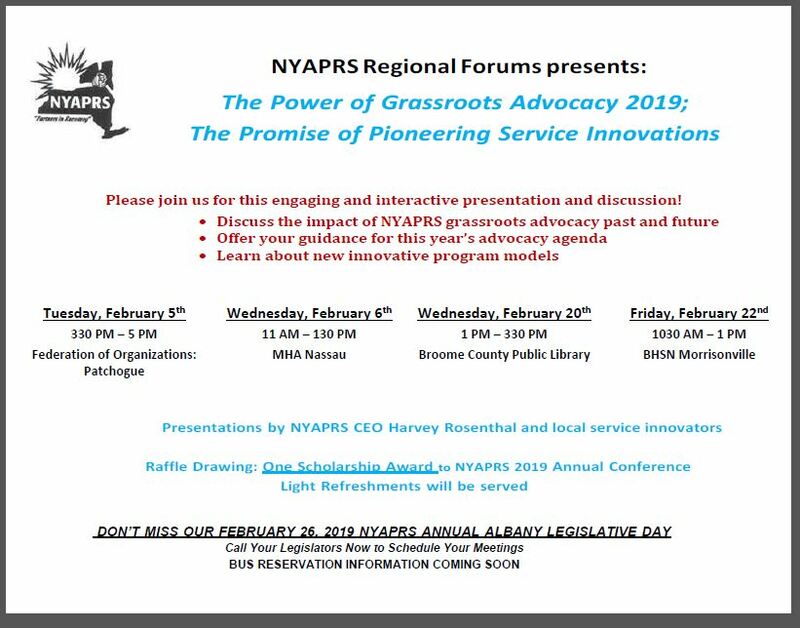 Contact your Regional Advocacy Specialist to submit an application to attend the in-person Regional Advocacy Committee (RAC) meeting in Albany on April 15 and 16. Submit a workshop proposal for the 2019 Alternatives Conference: Standing Together, Celebrating Our Gifts, Raising Our Voices. Conference is July 7-11, 2019 in Washington, DC. Apply to become a National Youth Advisory Council Member (age 16-30), or adult member representing veteran and peer specialist populations. Contact your Regional Advocacy Specialist for the nearest location and registration information. If you cannot attend, there is an online form you can use to give input. Scroll down the form to rank subjects. 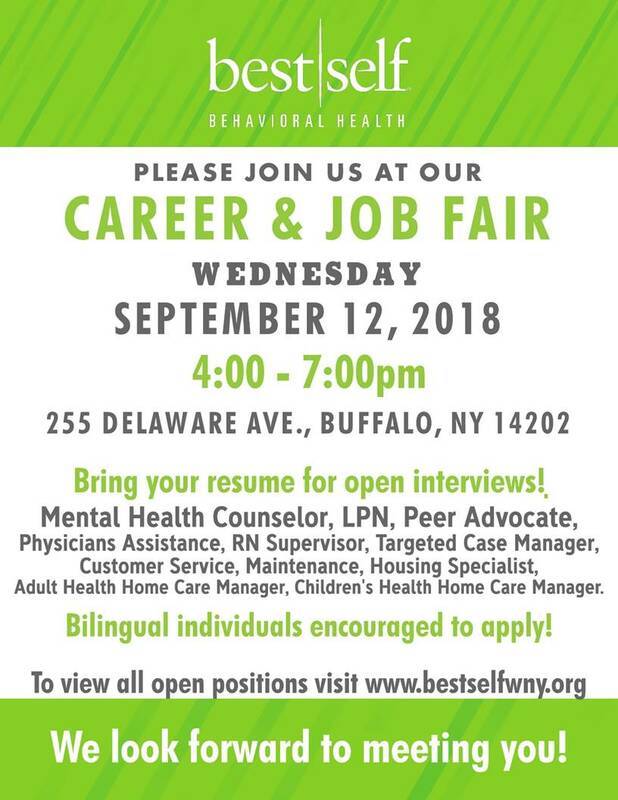 You must RSVP AND apply online to attend this hiring event! but rather an interactive question & answer webinar. Healthcare Workforce: Making it Work! Peer Recovery Advocates and Westchester Behavioral Healthcare employers. Join SAMHSA for the 2018 Voice Awards! Tune in to the live webcast. 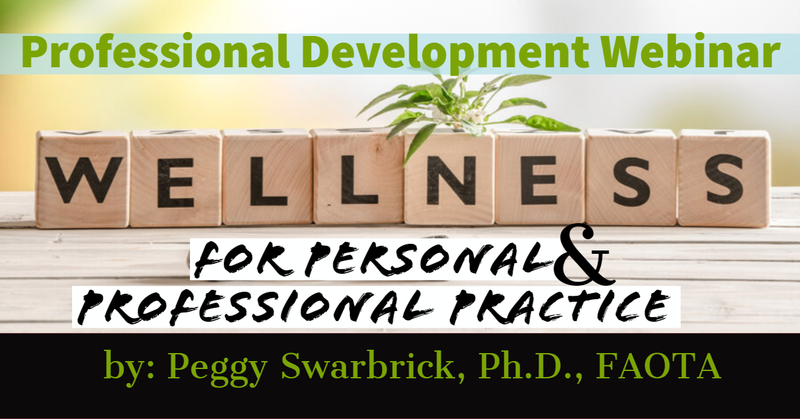 Webinar | 1:00 – 2:30 p.m.
Webinar | 11:00 – 12:30 p.m.
Webinar | 1:00 – 2:00 p.m.
Webinar | 2:00 – 3:00 p.m.
1:00 – 1:30 p.m. or 3:00 – 3:30 p.m.
We are at a pivotal time in human history. Please join the National Coalition for Mental Health Recovery (NCMHR) and the International Association of Peer Supporters (iNAPS) in the first in a series of webinars where we explore the relationship between ecology, how we relate to one another and the earth, and healing from crisis. We have gathered experts from around the globe, including indigenous peoples, to speak to this topic, share best practices, and propose some solutions to the very complex problems we face. John Naslund, PhD, Harvard Medical School, Global Health and Social Medicine will share his research and experiences working alongside individuals living with serious mental illness and community mental health providers. He will discuss ways to use technology and social media to overcome engagement challenges in a 21st century world. The Office of Consumer Affairs is hosting a public webinar detailing New York State’s 330.20 Criminal Procedure Law status and an overview of the process. This webinar is meant to shine a light on both the technical aspects of the “insanity plea” as well as the cultural aspects involved: from an individual and societal perspective. Contact OMH Regional Advocacy Specialist – Garrett Smith for information on accessing the recording. Supervising Peer Support Staff: What does it take? Nev Jones, M.A., M.A., PhD, Assistant Professor, University of South Florida and Matthew R. Federici, M.S., C.P.R.P. Executive Director of The Copeland Center will draw from the tools and resources in peer provided practices to identify respectful and meaningful approaches to engagement. Self-Care for the Peer Specialist, Denise Camp ALWF, CPRS, RPS, On Our Own of Maryland Training Specialist. A national initiative to expand financial inclusion for people with disabilities and their families, and EmpoweredNYC, the initiative’s first local program. Deadline to apply for the next training, which starts on February 5. 2-Day Seminar/Webinar on how to quickly get approval for SSI, SSDI, Medicaid, and other entitlement programs, presented by John B. Allen Jr. Special Assistant to the Commissioner, NYS OMH. For young, emerging leaders within the ages of 18-30. 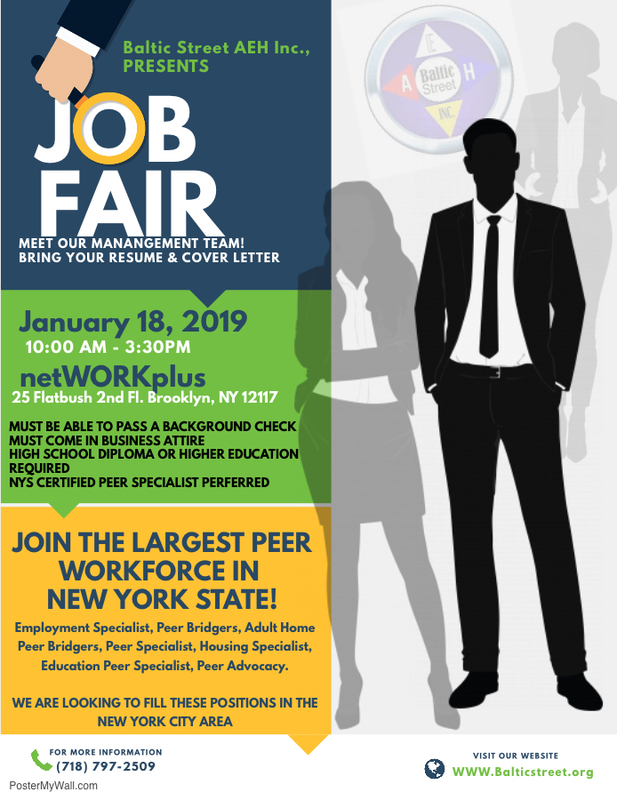 Deadline for Employers to apply for the Career Fair (to be held on December 1) as part of the New York City Substance Use and Mental Health Peer Conference. Subject: Registration Open for the 2017 Statewide Virtual Town Hall Featuring Commissioner Ann Sullivan, M.D.! Registration is open for the OMH Statewide Virtual Town Hall featuring Commissioner Ann Sullivan, M.D.! Register to learn more about the OMH vision for the future, including updates on the Commissioner’s top policy and planning priorities presented at last year’s town hall. As a Thrive NYC initiative, the NYC Peer Support and Community Health Workforce Consortium is committed to enhancing and expanding the peer support and community health workforces in NYC. To that end, the Consortium is asking New York City peers and community health workers to participate in our survey on compensation, job roles, certification and training. Survey participation is voluntary and responses are anonymous. All responses will be kept confidential and will only be reported in the aggregate. No identifying information will be shared with employers or any other parties outside of the Consortium staff. All participants who complete the survey are eligible to enter themselves into a raffle where 1 of every 40 respondents will receive a $40 VISA gift card. o A young person who uses their personal experiences as a means to directly support, advise, and empower other youth. YPAs serve in a variety of different capacities in order to help youth reach their goals. They may provide social and emotional support, skills-training, guidance to navigate child-serving systems, and more. Above all, YPAs are guided by empathy and firsthand perspective. In this way, they are uniquely poised to meaningfully connect with youth. Thank you for your ongoing commitment to this important work. Supervision – If you supervise Peer Specialists, and want to join a focus group let us know! Or, if you are a Peer Specialist, share this announcement with your supervisor. Sense of Community– Help us explore the factors that lead to a strong sense of community, which we will apply to further development of communities of practice in the peer workforce. Peer Roles – Help the Academy of Peer Services design team identify what’s needed for the next generation of courses to equip those in the peer workforce to be successful leaders, innovators, advocates, relators, connectors, and other roles that are essential for a strong peer support workforce. Click here for a flyer with information about participation. For individuals who have some experience with providing peer support services or are graduates of a Peer Specialist training program. For individuals looking to start or complete Academy of Peer Services (APS) certification. Thursday, September 28th, 2017, from 9 a.m. to 4:30 p.m.
Friday, September 29th, 2017, from 9 a.m. to 2:00 p.m. The 5-Day Basic Mediation training will include lecture, discussion, and role play exercises that help participants learn conflict resolution skills. The program includes discussion of different alternative dispute resolution (ADR) processes, the nature of conflict, the values of mediation, the mediation process, mediation skills, the role of the mediator and other parties, the identification and management of power imbalances, the identification and management of diverse perspectives and possible bias, and ethical issues. This training also covers specific case examples relevant to the peer specialist community. This is open to the public, however since we provide lunch, we ask people to register in advance. 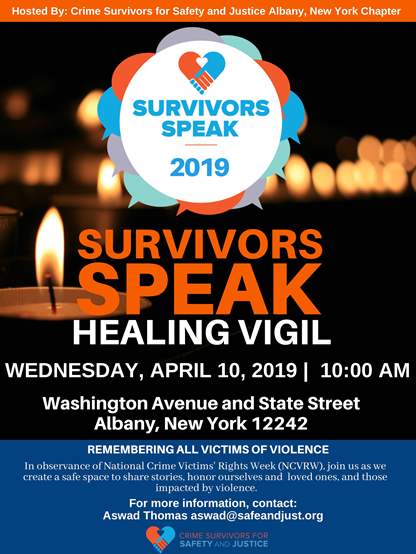 To register, please use the online registration page or call your Regional Advocacy Specialist to attend at a site that is closest to you. Registration will be closed at the end of the day on August 2nd. Joseph Swinford, Office of Consumer Affairs, NYS Office of Mental Health. 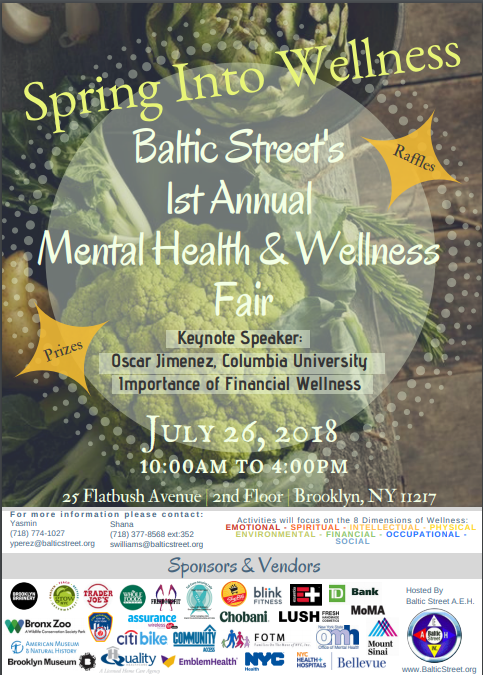 Calling all NYC Mental Health Peer Specialists! Convened by the New York City Department of Health and Mental Hygiene, CIMH, and the First Lady of New York City Ms. Chirlane McCray as part of the ThriveNYC Mental Health Roadmap, this event brings stakeholders back to together to incorporate a broader range of institutions involved in solutions, such as payers, the delivery system, and funders to build upon the work that has been done since the first Summit. Mental Health and the Behavioral Health Workplace? This webinar is to introduce you to DBSA Peer Leadership Center. This center is an easily accessible, impartial, and central location where peer specialists and peer supporters can fi­nd the information and training they want, connect with others working in the ­field, learn about employment opportunities and organizations that champion peer support services, and engage in dialogue to strengthen the peer workforce. Join a three-week training in May or June, 2017, to help you jump-start or complete the Academy of Peer Services Certification. Courses cover all relevant materials and offer a supportive, interactive classroom environment to facilitate your certification process! SAMHSA BRSS TACS Recovery LIVE! – Be a Part of the Conversation! Recovery LIVE! participants engage directly with presenters and each other through live chatting, polls, and other interactive features. Contact your Regional Advocacy Specialist for details. Individuals currently receiving Medicaid are encouraged to attend! May 4, 2017 | 10:00 a.m. – 1:00 p.m.
Wednesday, May 3, 2017 | 7 – 9 p.m.
May 3, 2017 | 8:30 a.m. – 12:00 p.m.
April 28, 2017 | 8:00 a.m. – 4:00 p.m. Description: Leaders of Peer-run Respites from around the country will provide an overview of Peer-run Respites and how they voluntarily engage people and offer a continuity of care which is often unavailable with traditional care and hospitalization. Success stories will be shared, along with reports from the latest research on Peer-run Respite effectiveness. Daniel B. Fisher, MD, Ph.D. – Chief Executive Officer, National Empowerment Center, Inc.
ThriveAtWork is a free training program that will support hundreds of peers (individuals who have used mental health services or supports) to get jobs within Human Services. This training is a key component of ThriveNYC, a comprehensive mental health plan for New York City launched by the Mayor’s Office and supported by the NYC Department of Health and Mental Hygiene. Click here for a program flyer. April 8, 2017 (Deadline to Apply). Tuesday, April 4, 2017 | 2:00–5:00 p.m. Please bring I.D. in order to enter our offices. To learn more, contact the Office of Consumer Affairs at (347) 396-7194 or oca@health.nyc.gov. Sunday, April 2, 2017 | 2:00–7:00 p.m.
An online discussion about maintaining one’s peer values, perspective, and identity while working with people who are mostly non-peers. Please be prepared to use your phone to ask questions. We will do this in a talk radio type of format. People will use the “raise hand” function and we will unmute your line and call out your name. This will not be an anonymous event. Provide your number when you join the event to receive a call back. If you use one of the alternate numbers, follow the instructions that you hear on the phone. For more, contact John Lyn at tel. (914) 664-3444 or email: JLyn@mhepinc.org. Hours | 5 to 8 p.m. Hours | 11 a.m. to 1 p.m. Hours | 11 a.m. to 2 p.m.
10 hours of SW CEU and CRC credits are available at no charge. Online option to attend is available, but must be onsite for CEU credit.